I have had dogs since I was old enough to walk. I love them. 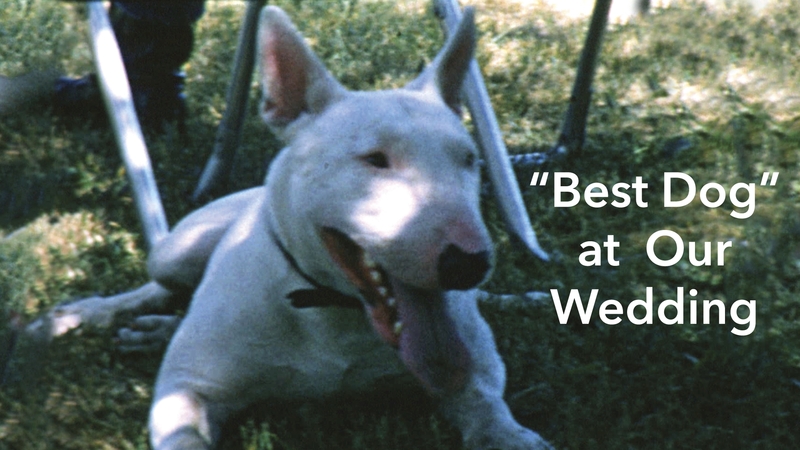 Manley was an English Bull Terrier and I got him as a pup from Zainesville, Ohio in 1969. I had earned some extra money as a carpenter that year. I was still single and looking for the right woman, so Manley was my first real turn at responsibility for another being. I named him after my favorite poet, Gerard Manley Hopkins. We were thick as thieves, as they say, and went everywhere together. Mostly we walked the streets of Ann Arbor, Michigan or roamed cemeteries or the local arboretum. When Manley was around two-years old, I met Margaret, finally someone I loved, who also loved me. I knew from the day I met Margaret that she was the one and asked her to marry me shortly after, and we were married three months later on July 3, 1971. We had zero money at the time, but managed to scrape together about $200. With that we had a wedding, and it was a great wedding at that. Who says you need money to get married? We did have some great help from one of my dearest friends, Tecla Loup, who not only made Margaret's wedding dress, but made a huge heart-shaped cake, and so much more. She also helped when my daughter May got married a few years ago, and so on. Tecla is one of the brightest and most capable beings I have ever met. She can do anything. Thank you Tecla! Tecla was Margaret's Maid of Honor, my brother Dan was my Best Man, and Manley was the "Best Dog." Manley wore a little black bow tie for the ceremony. We were married under a 200-year-old oak tree at the local Theosophical campground by a minister in the Liberal Catholic Church, which is a Theosophical church that espouses esoteric beliefs. That would be me. At the time I was vice-president of the Michigan Theosophical Society. If I remember right, we had homemade baked beans, potato salad, bread, and a huge cake. Of course, there also was plenty of beer and something was smoked too. It was a bright sunny day. For entertainment after the ceremony, my dog Manley was front and center, which is what this short video is all about. I am not going to tell you what he did. For that, you have to watch the video, but he amazed and amused everyone. So, take a few minutes out of your busy day, kick back, and enjoy this little video.